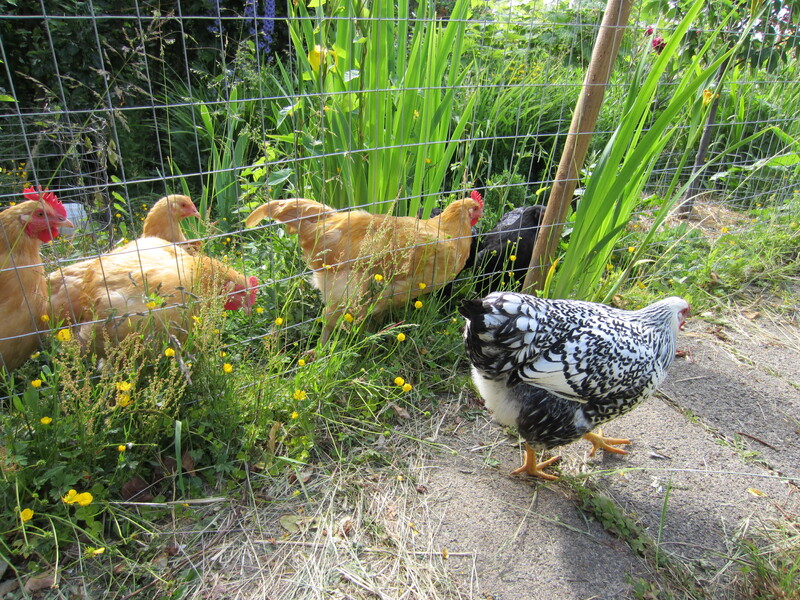 On Friday night, I went down to collect the dinner dishes from the chickens (rice, yogurt, leftover veg…yummy! ), and found something very special. Two tiny eggs! One was just inside the coop door, and the other was in the nest box. I was moved and awed. 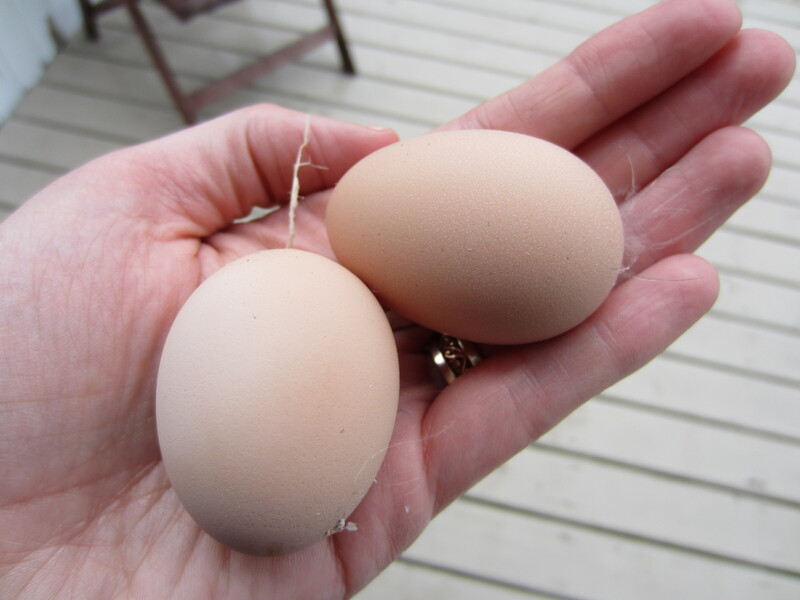 I wrote up a sentimental blog post about the two hens who had laid their first eggs. We’ve been waiting for more than a week for Patti and Selma, our two silver-laced Wyandottes, to enter this new phase of their lives, after their combs turned deep red and they started doing the “egg squat” and Selma the “egg dance” (it’s the squat plus a little stomp-stomp-stomp tatoo); both sure signs, we read. I was so struck by the loveliness that these two hens, who came together from the hatchery on their crazy, unnatural journey to us, and who have been inseperable ever since, would start laying on the same day, within hours of each other. They are so different in personality, yet they reign as Top Hen (Patti) and First Mate (Selma), must roost side by side every night, and follow each other around all day. How fitting, I thought, that they would wait for each other before dropping that first egg. It would have been a wonderful story, had it been true. You see, Patti is the chick I wanted to call Miss Adventure/Misadventure. She’s Top Hen because she’s always willing to go over the fence first and see what’s on the other side. It didn’t take her long to figure out that if she flew up to the top of the gate in the orchard, she could hop down and be free (except she never did figure out how to get back in to where the food and water and everyone else was!). We blocked off the gate, but she got out again somehow. We never did figure out how. A couple of days ago, I came home from work in the afternoon, and the orchard gate was wide open. All the birds were out rummaging around delightfully. Oh dear, I thought. One of us must have left the gate open. We swore we would pay closer attention. And we did. Saturday morning, I went down to check on the chickens to see how they were doing in the rain. The gate was wide open again. It had defnintely been closed at 6:30am when I had let them out. Because of the rain, most of the flock were huddled by the coop where it was dry. Patti was out in a nearby vegetable patch, looking wet and not very happy. She quickly scooted into the run when I opened the door. I noticed when I let her in that there was an egg in the nest box. Aha! It was still warm, and thus guaranteed to be Selma’s. The penny dropped. Patti must have laid her egg somewhere outside. I looked around the vegetable patch. I retraced her steps toward the orchard gate. I peeked over the gazebo fence where the straw bales are stacked. And there they were, tucked in a safe, dark, straw-covered corner. Three beautiful tiny eggs. So much for the perfect twins starting to lay on the same day! Instead, we had a newbie chicken owner (moi) who didn’t recognize that Patti’s pacing up and down the orchard fence like a prisoner in the mornings, and yet being completely content to go back in and join the flock later and not try to get out again meant that she was trying to get to her nest. And a newbie chicken owner who didn’t clue in that Patti might be smart enough to figure out how to open the gate latch! (It sounds far fetched, but it’s the only explanation! We need a web cam 🙂 ). So much for projecting sentimental narratives on one’s pets! This inter-species communication stuff is tougher than it looks! Today, I tried to outsmart Patti by leaving everyone in the closed run until the two hens were finished laying. Selma laid her egg in the nest box as soon as she could kick everyone else out of the coop. By noon, Patti was still acting calmly as if she had all the time in the world. I let them out into the orchard and figured it must be her day off. I checked for eggs throughout the afternoon and made sure the gate latch was secure. No egg. Skipper went to visit with the chickens and get them back in the run around 7pm. There was a tiny egg sitting in the straw under the apple tree. Woo hoo! I love it. Fresh eggs are so amazing, and I love that animals can sometimes figure out human contraptions. Congratulations! What a great story. When we were living on the farm, the animals would often outsmart me. Especially the bees. And seriously, how do insects outsmart humans? Quite easily actually!